We’d love your help. Let us know what’s wrong with this preview of Thailand by Joe Cummings. To ask other readers questions about Thailand, please sign up. Recommends it for: Thailand avast matey! HA! Well, let me TELL YOU... My mom has a client who spends half her year in the states, and half her year in Thailand. So, when my mom mentioned that her daughter (me!) and friends were planning to travel to Thailand, her client offered her house to us! Who could pass THAT up?! WELLLLLL... our lines of communication got crossed, and things didn't go QUITE as planned. My mother's client was so excited to have guests, she hired painters to paint her whole house... not realizing that would be occu HA! Well, let me TELL YOU... My mom has a client who spends half her year in the states, and half her year in Thailand. So, when my mom mentioned that her daughter (me!) and friends were planning to travel to Thailand, her client offered her house to us! Who could pass THAT up?! WELLLLLL... our lines of communication got crossed, and things didn't go QUITE as planned. My mother's client was so excited to have guests, she hired painters to paint her whole house... not realizing that would be occuring WHILE we were supposed to be staying there. Long story short? We were picked up by her relatives in Thailand and dropped off at a hostel, not knowing what was going on! We thought we were going to be living with a family, so we hadn't planned out what were were going to do there AT ALL. If it weren't for Lonely Planet, we wouldn't have had a CLUE where to go or what to do! This was sort of helpful, but I will admit I did most of my research re: accommodations online via TripAdvisor & Agoda, since hostels and hotels change owners and/or close or increase rates so quickly in Thailand. The book is heavy to tote around, and while the writing is okay, the user experience is lacking. For example, the maps are black & white and single-page instead of fold-outs, with confusingly numbered location keys/geo coordinates. You end up having to flip back and forth to se This was sort of helpful, but I will admit I did most of my research re: accommodations online via TripAdvisor & Agoda, since hostels and hotels change owners and/or close or increase rates so quickly in Thailand. The book is heavy to tote around, and while the writing is okay, the user experience is lacking. For example, the maps are black & white and single-page instead of fold-outs, with confusingly numbered location keys/geo coordinates. You end up having to flip back and forth to see where the restaurant or site you're looking for is located, and there's not enough emphasis on really important sites like airports, railway and bus stations, or transit stops. I REALLY wish that instead of spending money on pages of colour pictures of the country, food and natives, they had made colour, fold-out maps instead. Would also have liked more recommended walking tours for cities; there was only one for Bangkok (Wat Pho, Palace, Wat Arun) and it took two hours to complete, but I was in the city for days and again, used the Internet to find things like Chatuchak Market, etc. So, I got the Kindle-for-iPad edition and needless to say, I won't be doing that again. There are 0 pictures. 0. And there's a few maps, but they aren't fold-out or anything but segments of a larger map spread out over multiple pages. Impossible to read. Also, I got pretty tired of all the sections on how important it is to volunteer and about the carbon footprint and about how I shouldn't worry about getting a local's price because I probably make a million more dollars per day than the average So, I got the Kindle-for-iPad edition and needless to say, I won't be doing that again. There are 0 pictures. 0. And there's a few maps, but they aren't fold-out or anything but segments of a larger map spread out over multiple pages. Impossible to read. Also, I got pretty tired of all the sections on how important it is to volunteer and about the carbon footprint and about how I shouldn't worry about getting a local's price because I probably make a million more dollars per day than the average person in Thailand. There are several good sections, fortunately. 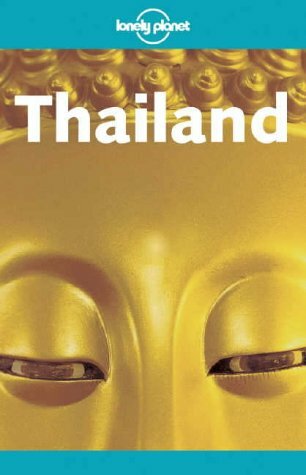 The first part of the book has some neat Itineraries that I wont have time for but wish I did; plus the Culture, Bangkok, Language, and "Thailand and You" sections were really helpful and thorough. In the final analysis, though, I didn't love it, and I will think twice before buying another LP book. I mean, I like how the tone of this book is very casual, like-you-are-talking-to-a-friend relaxed, but for me it was a little too relaxed. And too preachy. Of course, if you are a 20-something environmentalist socialist backpacker, go right out and get this. These are your people. I bought this book without ever seeing the person who sold it to me. In a traveling mailing list she mentioned that she had two identical books that she planned to sell one of those. As I was about to go to Bangkok and Hua Hin, well, this book helped a little bit. It was too wide, for someone who planned to stay more than two weeks and visit all over Thailand this will be a good book to read through and guide you. So far it's been pretty informative. I'm kind of sick of the lean on hostels and "youth" but that gripe includes websites I've gone to, etc. UPDATE: As to be expected, there were a few places listed in this book that didn't actually exist anymore and there were incorrect maps, but overall, the book served us well during out 18-day trip to Thailand. Ok, I'll admit that I only read the general information and the bits on Bangkok and Hua Hin, but they're the only places I'm going! The information I read was handy and I'll probably photocopy those areas before I go, rather than taking the whole book. I must admit, I am looking forward to the shopping, hopefully I'll have some money left at that point! mike had this one and the newer one. the updated one is better, of course, but this one was more than adequate. the most significant improvement is the all too accurate portrayal of the shameless, conniving tuk-tuk drivers, who took-took jocelyn and me more than once before mike arrived to make fun of us for being so gullible! one complaint with the lp books - too heavy. Not as good as the Lonely Planet city guidebooks I've had (Rome, London, Prague). But I saw sooo many people with this book around Thailand, so it must be the official travel guide to Thailand. I'm doing a rhetorical analysis of this book (among other things) for my masters thesis. So if you ever want to go to Thailand, i have two copies for sale. Good investment if your planning to explore the many hidden treasures of Siam.